Ahead of their sold out UK tour next month, The Slow Readers Club have released one of the stand out tracks from their top 20 album Build A Tower as a single. On The TV has quickly become a live favourite, audiences taking Kurtis Starkie's riff and singing it back to the band, both during and at the end of the song as well as in the encore break. The video features the band playing in an underground bunker and a young boy finding them in a disused building through TV screens and finishes in mystery and suspense (watch the video to find out what we mean). Long-term collaborator Chris Croft said of the video ""As we naively wander through the world each day a barrage of opinions, agendas and messages rain down on us. I imagine all The Slow Readers Club music videos I’ve made to date to exist in the same near-future post-apocalyptic world. On The TV’ is Lucca’s perspective on that world, as he tunes in to see a performance from the band, broadcast from their TV station bunker. The ending is intended for the viewer to bring their own interpretation, in our world it often feels like there’s an outside element in control - just waiting to lead us away." 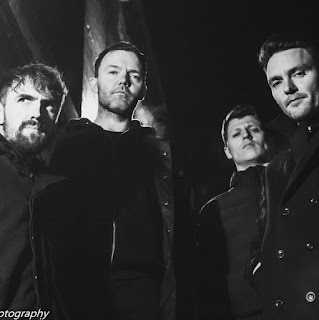 The Slow Readers Club's official website can be found here. They are also on Facebook and Twitter. They play Glasgow School Of Art (December 8), London Scala (11) and Manchester Apollo (14) as well as Groningen Eurosonic Festival on January 18 and Warrington Neighbourhood Weekender on May 26 next year.